The morning of November 19, 2012 would make me a true believer that hard work and relentless dedication does pay off. I first saw the "Seneca County Super Freak" in October of 2010, he was like a ghost. Only catching a glimpse of him as he slipped behind my stand at dusk. I would hunt the rest of the season not seeing him again. I searched hard for his sheds that spring shed hunting, finding two other impressive sets of sheds, but knowing neither of them was him. I was puzzled and almost convinced he didn't make it through the winter. His core area was a 60 acre overgrown mess that later I would understand made it very easy for him to grow into the old roman nosed warrior that he had become. In 2011 the old sly ghost buck did almost exactly what he did the year prior at almost exactly the same date. I caught a flicker of him out of the same stand at dusk. This time he actually came in and stood 50 yards away in the thick brush until after darkness fell. I had to wait at least 30 minutes after sundown for him to leave so I didn't spook him getting out of my stand. My spirits were briefly raised, but once again another year passed by with no other encounters. No trail cam pics and no sheds to keep the big buck itch burning. 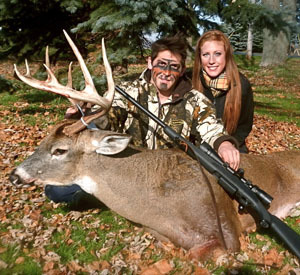 families and loved ones by being absent and single minded during our favorite hunting seasons. I was burned out by the first weekend of gun season and I failed to mention earlier I completely forgot about the "Super Freak" ghost buck because by this time he had just become another big buck tale that had come and gone in my mind. The 1st day of general gun season started off with a bang. An illegal bang from a car window shooting into the land across from my sacred hunting spot. This particular area is infested with poachers, or what I call buck pirates. These buck pirates cruise the back roads looking for trophy bucks. They carelessly take hail-mary shots from their truck windows. It makes me cringe and sick to my stomach thinking about it. Any how at 7:30 am my beautiful camera woman (Lisa) and I had two slick heads come into range, which I opted to pass. I counted 158 shots by noon and wondered when the deer were really gonna start moving on my property. I felt like the sheriff of a ghost town. The movement was slow the rest of the morning except for a small skipper buck that I had been seeing all season. We climbed down at noon for a quick bite to eat. Full on Burger King and Dr. Pepper, I hopped right back in my tree for the evening sit (or nap). While my best friend Bob (Fuzznuts) blistered a magnum doe at the headland of the property, I never saw a deer that evening. I decided to try something I hadn't tried all deer season for Sunday's excursion.Sunday morning's bright sun came up and tickled my face until I rolled over in bed with a big smile. I did absolutely nothing that day and it was phenomenal. Sometimes you have to take a step back and get your head right. their home blocks surrounding would be safely bedded in the huge overgrown thicket that I had sole permission to hunt. that caught my eye. Like an old navy periscope being slowly raised in enemy territory, a familiar, but much larger, 10-point main frame rack. It was "Super Freak" standing 100 yards in front of me in the switch grass. His tactic of staying calm, standing up slowly and holding tight to his bed had just backfired. In the 9 seconds it took me to process what was unfolding before my eyes I had already put a 260 grain Accutip right in his engine house. It was effortless and automatic. Three long years of pursuit ended in under 10 seconds. Soon after my dad called and said he shot a good one, I screamed back I just double lunged "Super Freak". An hour later I walked up on 15 years of experience, dedication and sense of accomplishment all rolled into one giant 5x5, 6.5 year old mature buck. period I'll put the tape measure to him. I could care less on what he actually scores. 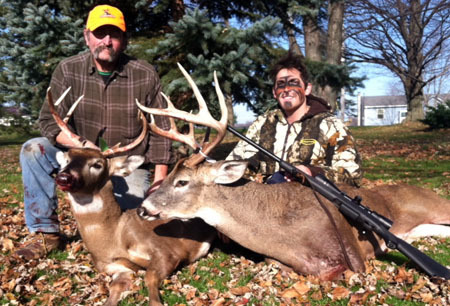 The challenge of beating a mature whitetail on his own turf is what it's all about. I shot him with my new Savage 220F, 20 gauge, bolt action slug gun.